In this white paper, we explore at some depth what is driving the growth of containers, as well as the opportunities and challenges of a specific container use case: databases. As a financial services provider, how do you best align your technology investments to your customers’ 24/7 expectations? Modernization and reinvestment in innovation are key. 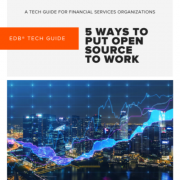 We countdown five ways you can put open source databases to work to enable these goals for your organization. Today’s financial services institutions must innovate and evolve their technology to remain competitive during a time of great disruption. High availability databases are essential to organizations depending on mission-critical, 24/7 access. 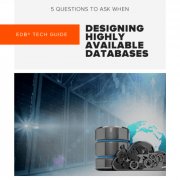 If you’re tasked with designing a highly available database, we detail five questions you need to consider before taking action. 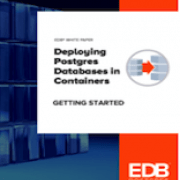 In this report we compare EDB Postgres and MariaDB capabilities for 6 enterprise requirements and assess their strengths on each requirement. Automation, Big Data, Cloud and Containers. 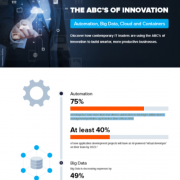 Discover how contemporary IT leaders are using the ABC’s of innovation to build smarter, more productive businesses. 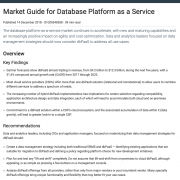 To learn about the options for database platforms as a service and how they compare, this is the definitive guide to Database Platforms as a Service (dbPaaS) with 19 vendor profiles including EDB Postgres Cloud Database Service (CDS), as well as EDB Postgres Ark. Learn why Gartner positioned EDB in The 2018 Magic Quadrant for Operational Database Management Systems for the sixth consecutive year. If you have your eye on moving your Oracle databases to the cloud, you have a lot of choices to make and options to consider. We’ve outlined five key decision points to help you navigate your choices and enable your success.